Byte CII sailor Paul de Souza will carry the Bahamian flag at the Nanjing 2014 Youth Olympic Games Opening Ceremony on 16 August to honour the 50th anniversary of Sir Durward Knowles taking the nation's first ever Olympic gold. 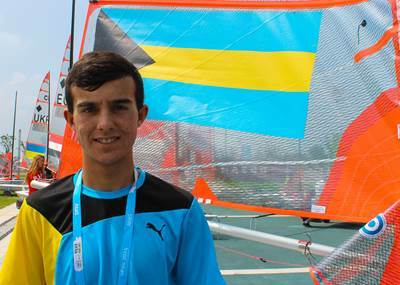 The 15-year-old will lead the 14-strong Bahamas team that features athletes in athletics, swimming and tennis but the eyes will firmly be on sailing's de Souza at the front of the pack. "I'm very excited because I'm the flag bearer from the Bahamas because it's the 50th anniversary since Sir Durward Knowles won a gold medal in the Star class so they decided to pick me as the flag carrier just to honour that,” explained de Souza. "I couldn't be any happier about it,” said de Souza with a beaming smile. "I'm almost speechless and I'm really proud of myself and my country that we all made it to this event. We're all from a small country and there are so many people here who come from countries with millions and we're a country of thousands. I'm pretty proud to be able to carry the flag and represent my country. Knowles and Cecil Cooke took the Bahamas first Olympic gold medal on 23 October 1964 at the Tokyo Olympic Sailing Competition in the Star class. Fifty years on and the Bahamas National Olympic Committee has put the spotlight on sailing. Knowles and Cooke will be honoured on the anniversary of their victory by a luncheon where the IOC will present Sir Durward with the prestigious President's Trophy – the highest honour given to athletes by the IOC. Sandra Cooke, the daughter of Cecil Cooke, will receive the trophy on behalf of her late father. Representatives from the International Olympic Committee, International Sailing Federation (ISAF), Japanese Olympic Committee and the Commonwealth Games Federation are expected to attend. Knowles took his nation's first Olympic medal at the Melbourne 1956 Olympic Games and then eight years later picked up the first gold. In total the Bahamas NOC has five gold, two silver and five bronze medals with the foundations laid by Knowles. In advance of de Souza heading to Nanjing for the Youth Olympic Games, Knowles gave him a few encouraging words, "A lot of times I am very modest and he said I need to be a little bit more confident in what I do and he said go out there and try your best,” said de Souza. Scheduled to start at 20:00 local time on Saturday 16 August at the Olympic Sports Centre Stadium, the Opening Ceremony of the 2014 Nanjing Youth Olympic Games promises to be a spectacular and unmissable affair. The IOC will be streaming the show live on its online channel, Olympic.tv, on www.olympic.org and on the official Olympic YouTube channel, with all three platforms providing coverage of all competitions from Sunday 16 August onwards.